1. Find an A4 blank sheet of paper and a hard flat surface. 2. Place your foot on the paper, including the socks you are wearing. 3. Take a pencil to draw the outline of your foot onto the paper and take ruler in cm to measure. 4. 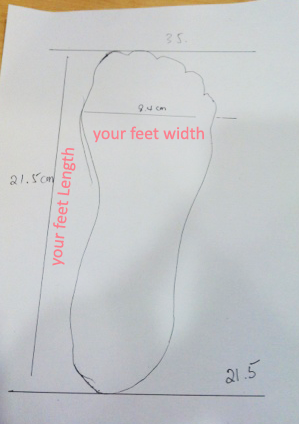 The longest length and the widest width of your leg will be the size for your shoe. 5. Feet width can be classified as slim, normal, wide, and very wide. If you consider your feet as "wide" or "very wide", we advise you to go 1 size bigger. 7. Don't forget to let us know your feet size in Lunavocy Size as shown above while placing your order with us.